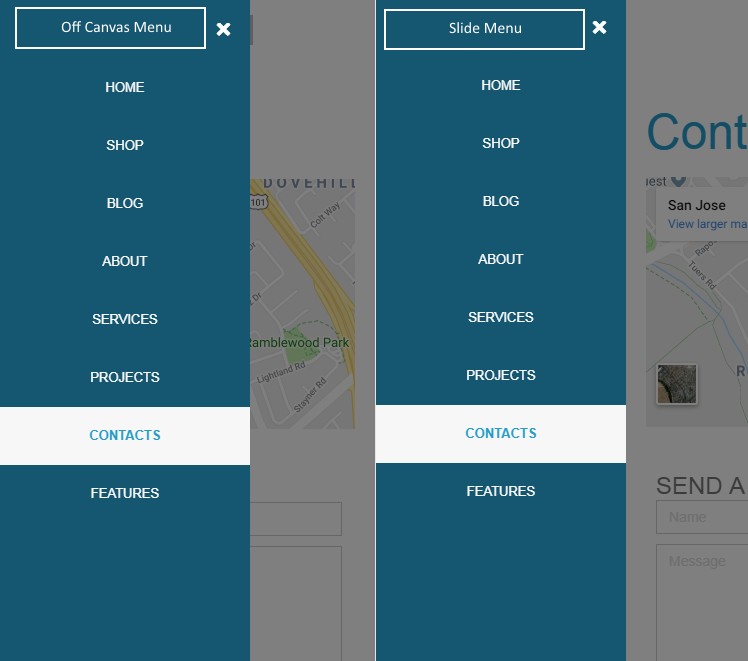 We're happy to introduce the new Off Canvas and Slide Menu opening options for Mobile Menu. When Off Canvas Menu option is used the menu overlaps the page, when the Slide Menu option is used the menu pushes the content to the right. 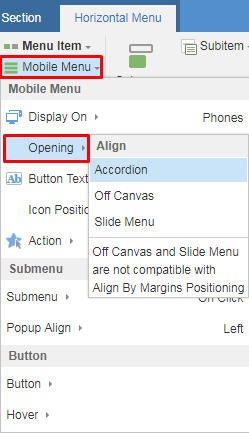 There is an option to add Header and Footer areas in the slide menu above and below the menu content correspondingly. These areas can contain various controls and even placeholders for the CMS modules. Fixed issues with the incorrect column height and alignment in some grid layouts. Unfortunately we cannot say exactly, looks like it was added with custom .css code. Wow, thats great Nettie. Appreciate your quick response. But, i just like to know if its http://www.webnoesys.com Artisteer HTML Website then how they used Mouse Hover Animation Effects ? This theme was definitely created with Artisteer. They even used a similar logotype for their website... Looks like this is not CMS, but Artisteer for HTML (Website template). Yes, you are right. We too came across this theme http://www.webnoesys.com which is also designed by Themler but not sure what they have used it like WordPress or any other language as one of my friend suggested that this theme is not used. The code is very stable and clean. How they have created ??? We are utmost surprised. Doesn't look like it is using Themler theme, judging by the code. They are trying to drive traffic to this site I am assuming. > mariyadems404, > > Doesn't look like it is using Themler theme, judging by the code. > > Sincerely, > Nettie They are trying to drive traffic to this site I am assuming. Yes, please we too need support quick updates on this please ? Hello, can support answer this? I have notification about new update on stable channel, can you share changelog? Hi. I have notification about new update on stable channel, can you share changelog? Unfortunately I cannot say what features will be implemented this year. And another one important question: do you plan to implement other new features to Themler in this year or only bugfix? Main forces as before is at Nicepage project? Do you plan update blank themes to v.456? Hi. Do you plan update blank themes to v.456? Laughing out loud to see you cry to keep Themler, never seen a company with such disastrous communication and disrespect towards its customers, and you're masochist or what, noob band. Keep crying, it's so funny to read. Laughing out loud to see you cry to keep Themler, never seen a company with such disastrous communication and disrespect towards its customers, and you're masochist or what, noob band. Keep crying, it's so funny to read. Hey there, themler is one of the best source for newbies like me. I have gone through it and of course, some issues initially. Most of them were resolved by going through the instructions and help guides on this website. But currently im facing mobile menu issues on my website [magisk root tool], can you please help? Can you elaborate the mobile issue on your website? Share the screenshot for the better understanding of mobile menu issue. Hey there, themler is one of the best source for newbies like me. I have gone through it and of course, some issues initially. Most of them were resolved by going through the instructions and help guides on this website. But currently im facing mobile menu issues on my website magisk root tool, can you please help? Any news and features, all are silent since so many days. Why ? I know lots of experts are available on this forum, can anyone let us know how to get it home icon instead of home menu in the horizontal menu. I am completely blown away by Themler now that I am fully used to how it works. I know some of it's quirks and most of the strengths. If they ditch this I will never trust this company again. I completely understand the decision to table Artisteer. It was not built for the future and could not be updated. 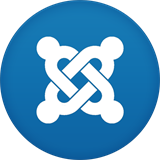 Themler is Bootstrap and WP and Joomla use this so it's a winner and they can keep it going. If nicepage works out that's great, but I cannot migrate again. If I do it's away from them completely. Themler, you guys have a very good product, do not betray you loyal customers please. Yes, Expecting Themler Team to Answer Now Please !!! I am completely blown away by Themler now that I am fully used to how it works. I know some of it's quirks and most of the strengths. If they ditch this I will never trust this company again. I completely understand the decision to table Artisteer. It was not built for the future and could not be updated. Themler is Bootstrap and WP and Joomla use this so it's a winner and they can keep it going. If nicepage works out that's great, but I cannot migrate again. If I do it's away from them completely. Themler, you guys have a very good product, do not betray you loyal customers please. Wow, you are right, Themler is really Great & Amazing to use it. Thank you Mr. Shaulhadar, Appreciated!! !